The Scosche MagicMount™ Magnetic Pro Vent is a magnetic mounting system for conveniently mounting smartphones, tablets and more. Just hover your device near the magnetic surface and it instantly locks securely in place. This cell phone car mount system is sleek and versatile. The cradle-free design uses high-powered magnets to secure your device where you use them most. Place your device at any angle for convenient viewing. On the road, at the office, at home, EVERYWHERE. 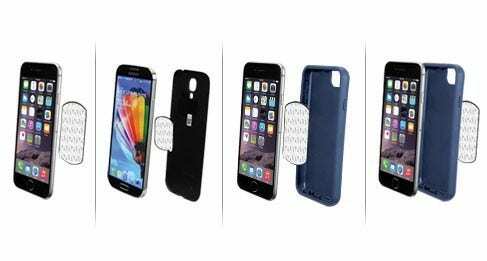 This magnetic phone mount utilizes it's griping power by adding a small metal plate to your device. Whether you like your phone naked, or use the larger, bulky cases on the market, this mount is for you. The included MagicPlate can be applied directly to your device, adhered to the battery just under the battery cover, sandwiched in-between the phone and case or to the outside of the case. *MagicMount is not recommend with use of a wallet case or wireless charging.